RoRo is 6.25 yrs old and loves the Statue of Liberty so much that we drove to see her last spring break. He is half Afghan. His dad fled in the 80s when the Soviets invaded Afghanistan, so welcoming immigrants is meaningful to us. In this divisive election, we want to remind Americans to be loving, welcoming, helpful, and inclusive. Ro also instinctively challenges rigid, traditional gender rules. 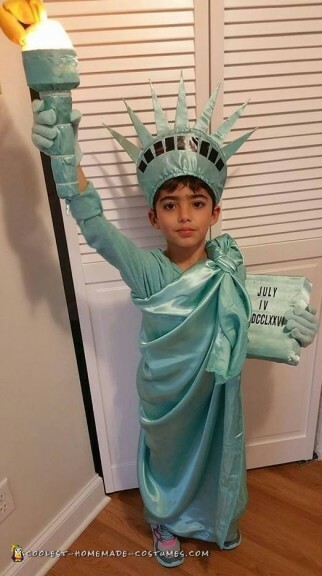 So dressing up in a Statue of Liberty child costume made perfect sense to him and he beams proud in this costume. Not counting the sneakers and long johns, which can be used beyond Halloween, the whole thing costs about $7 (material, visor, gloves, felt) and includes a lot of stuff I had around the house (scotch tape, glue, string, electrical tape, letters, sharpie marker, cardboard, thread, eye shadow, staples, socks, graham cracker box, flashlight, zip ties). Yesterday, RoRo lost a contest he was sure he’d win at Lowe’s Home Improvement because they picked a boy in a wheelchair instead. Ro was perplexed and that gave us an opportunity to talk about many things, including how that other boy might feel, why winning isn’t what’s important, how to be happy for others, how to give opportunities your best shot and accept the outcome, and how the fun is really in the making of the costume and the reactions on the faces when we ring the doorbells.